On August 19th, Alexa Ross ’13 and Lang Center Research Associate George Lakey ’67 had the charges resulting from civil disobedience dismissed in a D.C. court. The two were arrested last September when they participated in non-violent direct action in Washington D.C. to protest PNC Bank’s funding of mountaintop removal. Lakey is also the Former Lang Visiting Professor of Issues for Social Change. Ross and Lakey were two of thirty-five protesters at the PNC Bank in Washington D.C on September 28, 2010. 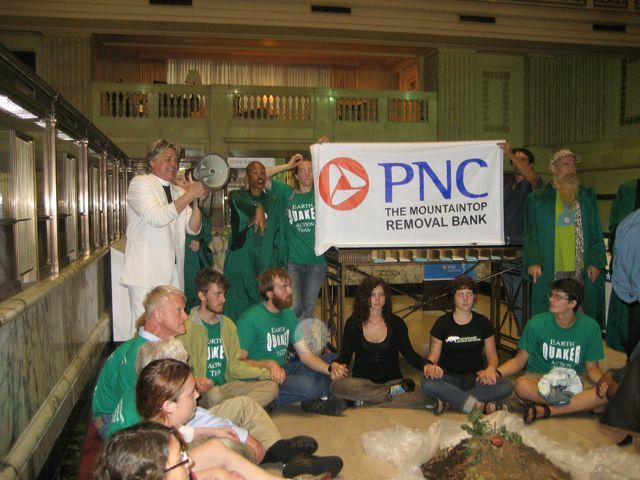 At the time of the protest, PNC Bank was the largest U.S. financier of mountaintop removal, a form of coal mining that requires the removal of the summit or summit ridge of a mountain in order to gain access to coal seams underneath. Ross and Lakey were two of four who were arrested; also arrested was New York-based performance artist and activist Reverend Billy Talen, who spoke at Swarthmore in April. Lakey explained in a blog post that “we walked into PNC’s ornate and historic bank near the White House. Reverend Billy set down on the middle of the marble floor a tarp and the rest of us poured dirt on it, creating a kind of mountain complete with twigs and leaves and a little red sign saying “Stop.” Eleven of us made an arc around the dirt mound, sitting as we did so, while behind us the Gospel choir of the Church of Life After Shopping began to sing. A banner was held aloft: ‘PNC Bank: The Mountaintop Removal Bank.’” He continues, “the police checked us out and went away to deal with more pressing matters … it was clear that the authorities would ‘wait us out,’” and eventually “the police returned and [we] were handcuffed and walked out of the bank to the waiting police cars.” Footage of the arrest begins at 2:23 in the following video, which Reverend Billy posted on his Facebook page. Lakey and Ross were not arrested in the interval between September and their August hearing, and so their records were expunged, or destroyed. Reverend Billy has been arrested twice in New York for civil disobedience, and so he will appear in court again. He has filed a contention, according to Lakey, that he is being singled out in a group of others risking arrest by the New York courts, and that the judge should include this information in the final ruling. According to treehugger.com, a related demonstration held on the same day outside the White House resulted in the arrest of over 100 protesters, including Dr. James Hansen, the head of NASA’s Goddard Institute for Space Studies at Columbia University. Both protests were organized by Appalachia Rising, a coalition of activist groups that began with the September protests and “marked,” according to the Appalachia Rising Facebook page, a massive acceleration of the national movement against surface mining and a foundation upon which to build a pan-Appalachian movement for prosperity and justice.” Professor Lakey is a “member-at-large” of Earth Quaker Action Team, one of the coalition members. At the time of the protest, PNC Bank had provided more than $500 million in loans and bonds to six companies practicing mountaintop removal: Massey Energy, Patriot Coal, Alpha Natural Resources, International Coal Group, Arch Coal and Consol Energy. In 209, these six companies were collectively responsible for almost half of all mountaintop removal coal mining in Appalachia. In November 2010, PNC announced that it would cease all funding for mountaintop removal. PNC also has a branch in the Borough of Swarthmore, at 31 South Chester Road. In October, the EPA recommended revoking the permit for a the Spruce No. 1 mine, which would be one of the largest mountaintop removal projects ever authorized in West Virginia, under Section 404, which authorizes EPA to prohibit, restrict, or deny the discharge of dredged or fill material at defined sites in the United States if the use of such sites for disposal would have an unacceptable adverse impact on natural resources. In 2002, the Bush Administration expanded the list of materials that can be used to fill streams and wetlands to include mountaintop mining “spoil,” the rock and dirt that once was the top of the mountain. Dumping spoil in streams and wetlands pollutes those sources of water. In addition, among West Virginia adults, residential proximity to coal mining is associated with higher risk for cardiopulmonary disease, chronic lung disease, hypertension, and kidney disease, the EPA report said. After seeing West Virginians with undrinkable water, and mountains literally being uprooted from the ground, I can no longer just think about what goes on in Appalachia. That’s why I believed this action to be unavoidable. And I come here today with the people and land of Appalachia on my mind. But if I have anything to say for myself today it’s how lucky I am to live in a place where I can be a part of change in the absence of violence. I’m sorry my love but use of the term civil disobedience fits for many of the reasons Jon highlighted – the phrase indicates visible noncooperation in an attempt to invoke a change in policy or attitude. Regarding civuil disobedience and private property one may look to the actions of SNCC. The Freedom Rides and Sit-Ins involved the disruption of affairs on private property. Their actions stood more than the simple use of public facilities and services – the leaders of SNCC set out with the explicit purpose of disrupting business in/on privately owned and buses) restuarants to push for change. It is generally accepted that SNCC’s methods, in addition to Dr. King, served as an example of the sort of civil disobedience that defined the ’60s. Whether you agree with such methods or prefer living in the woods is up to you, nonetheless disruption of affairs and the violation of assorted polcies/general expectations defines CD. As well it should. Forms of political action and communication should almost always change and evolve over time. It’s true that what they did violated private property. It’s also true that private property is a legal institution, as are tax codes and voting laws. For me, the bottom line is that a bank has the power to exercise enormous control over our economic, social, political, and, in this case, environmental future. And that’s why what they did was totally on point. It might be worth pointing out that the wildly successful tactic of sit-ins, which were practiced both by Gandhi and MLK, also seem to “violate private property” (many, for instance, where directed at restaurants). Of course, sit-ins don’t involve soil. But, since there was a tarp placed on a smooth marble floor, it seems to me that sit-ins and the tactic here were both pretty easy to clean up afterward. So, I’m not sure that this action represents much of a break from the tradition as you suggest, at least not for reasons relating to private property. I too have a mild qualm with ‘civil disobedience’ in this article, given that pouring mounds of soil in a city office building clearly violates private property. This seems to stray from traditional actions of civil disobedience, practiced by the likes of Thoreau,Gandhi,and MLK. Correction made; thank you Miriam. John- I wholeheartedly disagree when you say there is “opinion implicit in the term” civil disobedience. Civil disobedience is the open, non-violent, refusal to obey particular laws, typically to make a political statement. Alexa and George’s action’s fit this definition rather well. What I think you mean is that because people associate civil disobedience with the (positively viewed) Civil Rights Movement, that we are implying that Alexa and George’s actions were positive by using the term. But I don’t think that’s a fair criticism at all. There are plenty of controversial folks that use civil disobedience to disrupt the state. For example, check out The New York Times coverage on failed Mexican President Manuel Obrador, who engaged in weeks of civil disobedience to protest election results even after an election tribunal ruled that he had lost. The New York Times was not trying to equate Obrador with MLK when they said he was engaging in Civil Disobedience. They were simply pointing out that the man was organizing non-violent, illegal, protests. Don’t you think it’s editorially unwise to use the phrase “civil disobedience”? It seems that Alexa & George referred to themselves that way and the Gazette just went along, despite the opinion implicit in the term.